CLI flag names have been upgraded from --org to --team. --org commands are still compatible during this deprecation period. Developing and deploying applications within an Enterprise Team is largely the same experience as doing so in your personal account. Git-based deploys, command-line scaling, and add-ons all behave as expected. However, just as with account administration, there are a few additions to the experience you should be aware of when working within an Enterprise Team. Enterprise Teams centralize the management of users and roles. If you wish to join an Enterprise Team, an admin user must add you directly. Once you have been added to a team, you can select it in the Heroku Dashboard to view its applications. The Heroku Dashboard displays all teams that you belong to in the sidebar. As an Enterprise Team member, you have the ability to list and access all applications in the team. You can click an app in the app list to view its basic details, including who can give you more permissions on the app. You need additional permissions on an app to be able to deploy, scale, work with add-ons, etc. Going to an app’s access page will show you what access you currently have on the app. Team admins and users with manage permission on the app can grant you additional permissions. join happens automatically on the Heroku Dashboard. When you are no longer working with an application on a regular basis, you can leave the app. This revokes all of your permissions on the app, but you can always click on it again to restore basic view access. Or, in the Heroku Dashboard, go to the Access tab of the app and remove yourself from the list of members. If you have existing apps you’ve been developing under your personal account, you need to transfer them to your Enterprise Team in order for them to be considered part of the team and billed against it. 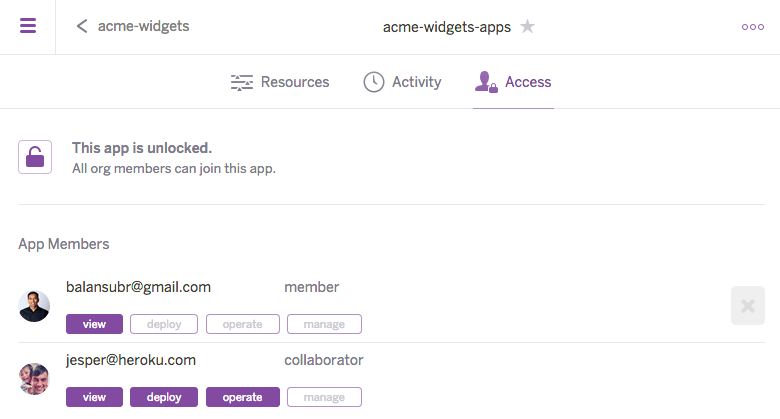 You can also use the app settings page in the Heroku Dashboard to transfer app ownership. The Heroku CLI defaults to using your personal account and requires the --team flag when performing team actions. If you generally work under a particular team, you can set the HEROKU_ORGANIZATION environment variable in order to default to that team. This won’t persist when you open a new shell, however. For that you can add this setting to your profile file. For Unix machines using bash, this is likely ~/.bashrc. For Windows you can set environment variables on the Advanced tab of System in the Control Panel. This guide gives you a high-level overview of developing applications within an Enterprise Team. To learn how to manage a team as an administrator, see one of the articles on creating and managing an Enterprise Team or managing Enterprise Team users and app access.